It has been a while since I baked Baguettes. I used the same Vietnamese Baguette recipe I shared sometimes ago. This time however, I omitted the Vitamin C and the bread still turned out soft inside. I don’t think it made any difference without the Vitamin C. In conclusion, I don’t think Vitamin C does much to making the bread softer from my experiment. The original recipe was adapted from Danang Cuisine. In a mixing bowl of stand mixer, combine the yeast, sugar and lukewarm water. Stir well to dissolve. Add half of the flour (200 g) and stir well to create a thick mixture with consistency of pancake batter. Cover and leave it in a warm place for 2-3 hours, until bubbles appear all over the surface. Add the rest of the flour and salt into the starter dough and using the dough hook on a stand mixer, knead until the dough comes together and elastic. It takes around 10 to 15 minutes. If the dough too wet, add 1 tablespoon of flour at a time. Cover with kitchen towel and let it rest in a warm place (35-37°C or 95-98°F) for 1 hour or until it doubles in size. Carefully transfer the dough onto the working surface. Do not punch down the dough and try not to deflate the gas inside. With a scrapper or a knife, divide the dough into 3 equal portions. Twist each portion inside out and form into a ball. Cover with kitchen towel or plastic cover and let them rest for 10 minutes. Take out 1 portion and roll out with your palm into round shape. Roll it and pinch the edges together. Place both hands on top of the dough, roll it back and forth on the counter, applying more pressure on your baby fingers than your thumbs to shape it into banh mi form (broader in the middle and slimmer at both ends). Place the shaped dough on a baguette pan and cover with kitchen towel. Let it rest for another 1 hour until it rises double in size. Half an hour before baking, preheat oven at 250°C. Place a tray of hot water at the bottom of the oven. 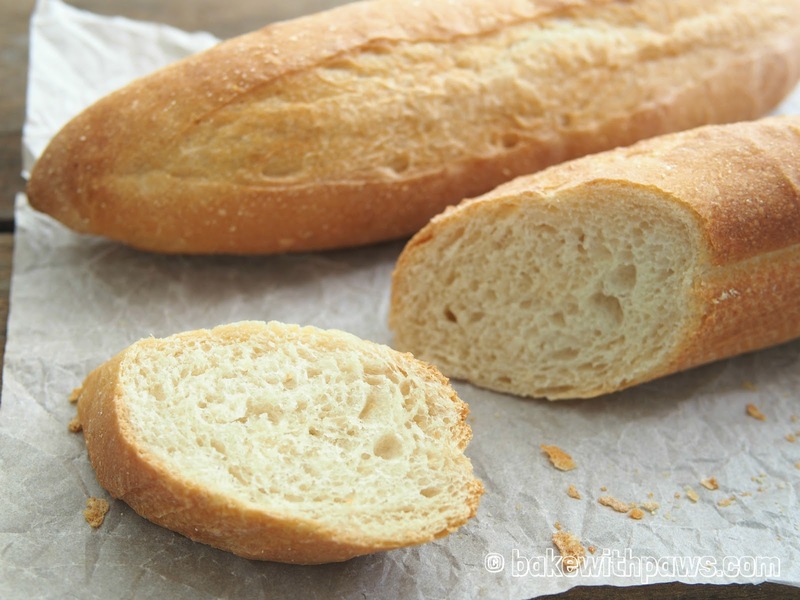 To slash the baguette, use a paper cut knife or a razor blade, keep it at 45° angle, and make a quick and determined slash across the dough lengthwise. Bake immediately after slashing. Turn down the oven to 230°C and bake for 20 – 25 minutes on the middle of the oven rack. After the first 8 minutes, spray water one more time on the baguettes and rotate the baguette pan to bake the baguettes evenly. When the baguettes are done, turn the oven off and leave the baguettes in the oven for another 8 to 10 minutes. Let cool on a rack after that. To yield a good crust, the oven must be very hot. Preheat oven 30 minutes before baking at the maximum temperature. Bread crust stays crispy while the bread still warm. However, it turns soft once it cools down. 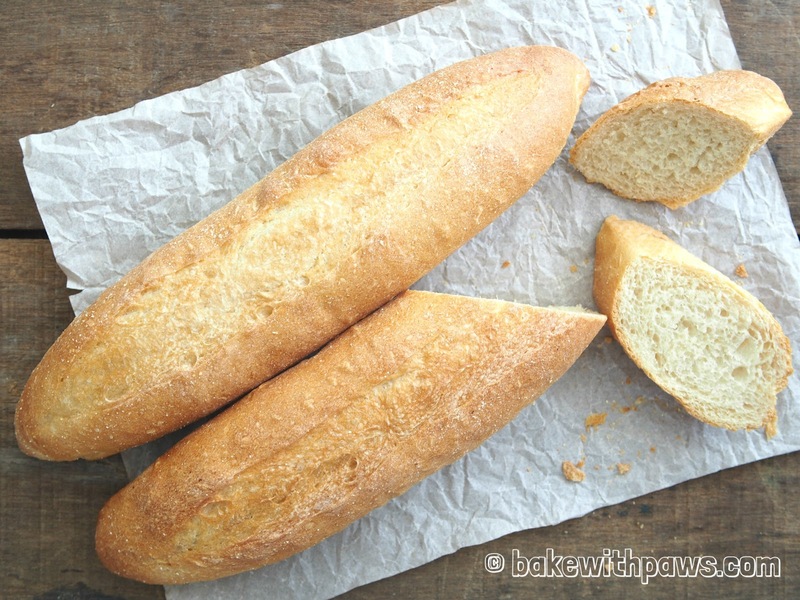 To get back the crispy crust, just put the baguette in a hot oven for 10 to 15 minutes to reheat. The temperature and duration of baking mentioned above just a guideline. Please adjust accordingly to your oven.